I have received a number of water tower photos in the last several weeks. You are all getting so good at spotting the great ones, and I appreciate your taking the time to photograph them. Of the many recent submissions I have received, these are a few of my favorites. They are now on display at my Water Tower Studio. The first thought I had when I looked at this tower on the beach was.. sun on the head makes for early balding, no matter how much water you hold. This guy has a rather wide-toothed comb by his side for windy days. Wind and comb-overs aren’t a good combination, and I’m sure it’s hard to use much hair product when you’re a Beached Water Tower. Kerri tells me this is close to where Sherry Dykema Phillips lives and Weeki Watchi…Nice! Thanks for this marvelous addition to the collection Kerri. I did something a little different with the photos Lewis sent me. I wanted you all to see how I saw the majesty of the first picture of the tower. It almost looks like a burst of sunlight showed up just as the photographer snapped the shot. The sad thing is that if this would have been in Quitman, Texas instead of Quinlan, it would have been the home of the famous actress Sissy Spacek. She starred in The Coal Miner’s Daughter and The Help. It’s amazing how two little letters can change the whole dynamics of a water tower. Now you get why I showed both photos. I still love that first picture with nothing but blue sky and sun reflecting on the tower….Great work Lewis! Cowboys, Cowgirls, and Colome, hence the name Triple C of Green. You can C Cowboys written down the side of the metal stabilizer post. Cowgirls can be ceen on the other post. Very good Dianna!! Mitchell, South Dakota…submitted by Kerri Venard. This Water Tower is near and dear to my heart which is why I named it after an important event in my Mother’s life. Yes..Once upon a time Loretta Sanderson was voted Miss Highway 16, and was honored with a trip to the Corn Palace. She was indeed, a Highway Queen. I believe she was the first Queen in our family, but as we all know,…not the last. What a thoughtful thing to do Kerri. Thanks for the memories. London England…Submitted by Queen E.
I was going to name this Tower “Trail of Vapor,” until I noticed the For Sale sign. Lewis, am I right? Is this at Lackland AFB? I will turn this entry into a plea to save the Tower. Water Tower lovers everywhere..Please Help Us. We will meet in San Antonio in a week or two to organize a protest. I sure hope they haven’t started making waterless water towers like they have waterless water heaters. I don’t understand how they do that. This is a late entry..It came to me anonymously..Yup! This is a waterless tower. What will they think of next? Remember…You can live without Gold, but you can’t live without water. It was a wonderful Easter in Beasterhop Land, and Mr. Beasterhop and I want to thank everyone who spoke an encouraging word, read my words, spread the word, expressed loving words, sang and danced the words, and otherwise promoted my desire to get the Beasterhop story out to as many young readers as possible. The story was inspired by a favorite childhood memory, and it was a labor of love to write about the character I made up when I was just a little girl. Many times throughout the years my family talked about the Beasterhop, and how I had imagined him. He was a rabbit that rode on a bicycle, and now he has come to life in a big way. I decided to write the story in the same rhyming cadence as the Mother Goose nursery rhymes I loved so much. The Beasterhop has a family, and works very hard to feed all of the bunny mouths, but he also tries to teach his children the things they need to know to grow up happy and healthy. The child in the story talks to the father about things that concern all children. Together, they watch the Beasterhop model what a good parent child relationship might look like, and learn ways to communicate their own feelings to each other. There will be more Beasterhop stories as the the characters all grow and learn from each other. Through their stories children and parents will also see how important it is for families to play together, as well as look out for one another. A special thank you to my brother, Billy Francis for suggesting I write the story. I also want to thank Pat Davis for reading it first, and loving it. She supplied all the bunnies I took pictures of to illustrate the Beasterhop family. Thank you to Bradyn Burelsmith for drawing the very likeness of the Beasterhop I imagined as a youngster. Some very special friends and family members topped it all off by planning and executing the Book Signing. I’m really grateful to all of you. Thanks to my husband Kip, who was as excited as I was to see the finished product. My hope is that my grandchildren, as well as yours, one day read the Beasterhop stories to their children and the books become as worn as my old Mother Goose book. If you haven’t purchased a book, or want to tell others about it, you can find it on amazon under my name or the name of the book, “We Shall See what We Shall See,” by Mary Francis McNinch. We never have to be without the love of God within. My love for you fills up my heart much more than ten times ten. Rerun..still having fun in Wyoming! The little Murdo Girl isn’t feeling well today, so she has deferred to “the lady,” who would like to share stories as remembered by some of the cousins. I know you’ll enjoy these tales. If given the opportunity, many of us would like to spend one more magical moment in a place that warmed our hearts. I have no doubt many, if not all of M.E. and Mary Sanderson’s family would choose the Nemo cabin as their destination. The old walls, papered in pine cones, beds with lumpy mattresses, and heavy warm quilts. The sounds of the creek, laughter, frying fish, and the breeze blowing through the Pine trees. All these things never changed…just like Grandma and her beads, you could count on it. Rerun…Hope everyone had a wonderful Easter..Mine was the best! I’m going to work more with the little Murdo Girl as she writes her papers. Her cousin, Valerie, proofs each one, and we make corrections as needed. We discovered, however, that once the paper is posted, the edits don’t carryover for the email readers, as it does on Facebook. (Whatever that is.) She loves that you read her stories. I think she might want to be a writer when she grows up. Well, the lady told me that I wrote too much yesterday. She also said I should come up with a better ending for the Falling Rocks story. She said it didn’t make sense that a tribe of Indians would put up signs when they can’t find an Indian Princess. It’s my dad’s story, and I forgot to ask him how it ended. I’m sitting in an airplane and I’ve been thinking. Something has been gnawing at me. It was pretty subtle at first, but now the insidious thought can’t be denied. Without even realizing it, I have been wearing my Queen T shirts. Today I have on the shirt that says, “All queens are born in December.” Am I supposed to just wear that on my birthday? People have started to call me Mary instead of Murdo Girl or MG. It makes me sad. Do you think this all happened because I’ve been wearing bunny ears a lot? Maybe I can’t have it both ways. This picture was taken during better times. I suppose Val, I mean Lav is feeling the same way. Although, since she broke her $60 crown, she’s been wearing those cheap knockoffs. She doesn’t care as long as the package says you have to be over 3. 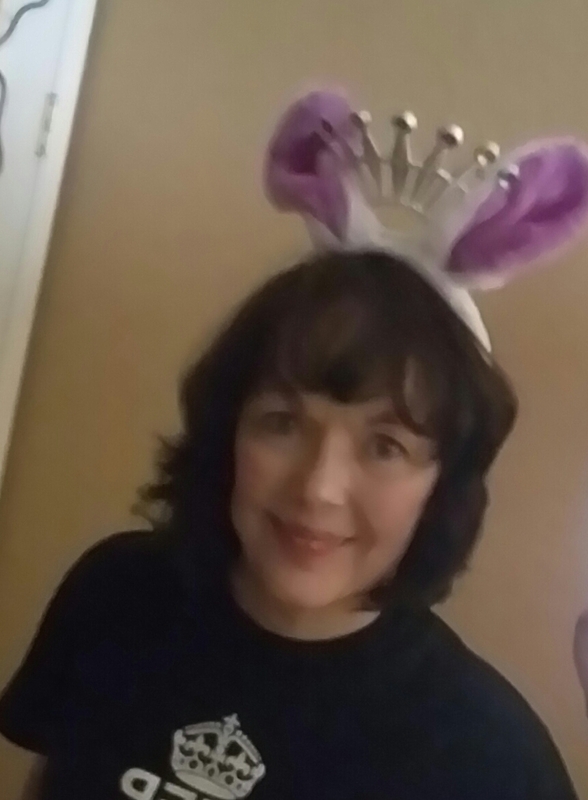 It really lowers the bar, but then so do tinfoil crowns and bunny ears. Looks like Lav is brainstorming again. When was the last time you saw Queen E in the news? It’s a rare day that William and Kate aren’t caught in some priceless pic. One day Prince George had a cold. I saw his nose being touched by a tissue from 8 different angles. 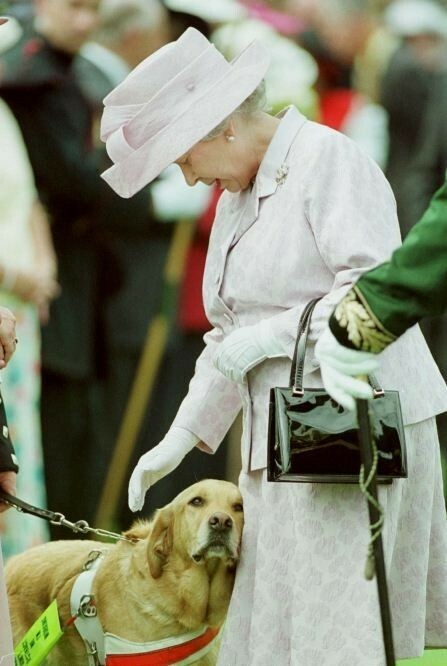 Yes Pearl the dog, we’ve been cast aside. Oh well. I guess I could start a support group for Queens without crowns. I’m sure there must be more of us out there suffering this blow to our heads. If we don’t do something soon, I fear for our children’s future. 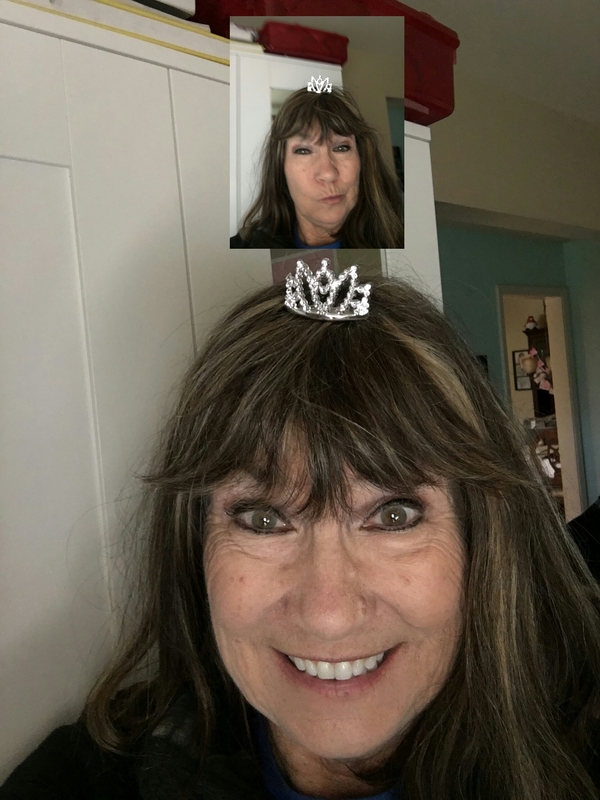 I can’t begin to imagine a life without crowns. Discussion: Ways to wear your hair without the adornment of a crown. The featured speaker will be the former Princess Fergie. 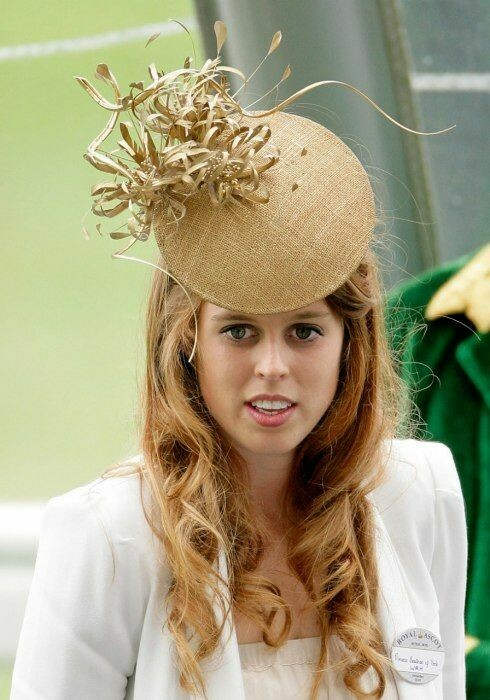 This is Fergie’s daughter Beatrice over compensating again.